What are “Post Clicks”? All posts on my page are not clickable. I thought that a Facebook user can't click on a post itself. He or she can only click on Share, Like or Comment. How can I have 14 post clicks, if my page has zero likes, zero comments and zero shares? From where did that 49 came from? What am I missing? BTW: I asked the same question on Facebook Community. Post clicks are "the total number of clicks on your post, not including likes, comments, or shares. " What are the different work statuses on Facebook? 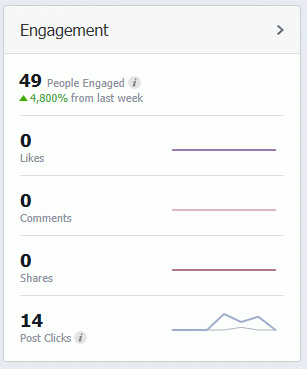 Abnormally low participation on Facebook posts, is something wrong?